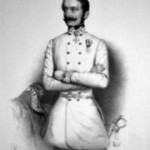 Ludwig August Ritter von Benedek (b. 14 July 1804 – d. 27 April 1881), also known as Lajos Benedek, was an Austrian general (Feldzeugmeister) of Hungarian descent, infamous for being the commander of the imperial army in 1866 in the Battle of Königgrätz against the Prussian Army. "Si j'avais eu Berthier, je n'aurais pas eu ce malheur"; Napoleon on Saint Helena speaking to Las Cases about the defeat at Waterloo.